Our little dude just turned 17 months old last weekend and it seems like time is speeding up everyday with him. Most recently, his vocabulary is really picking up but he’s in that cute phase where really only Mom and Dad can understand what he is saying. But two words that he is pretty close on is “Nana” which is obviously banana and “Nack” which is snack. So this is my attempt to come up with a kid snack that he can say at least some of the words in the title. Okay, sure, he can’t say Peanut Butter or Yogurt or Pretzel, but we’ll get there! 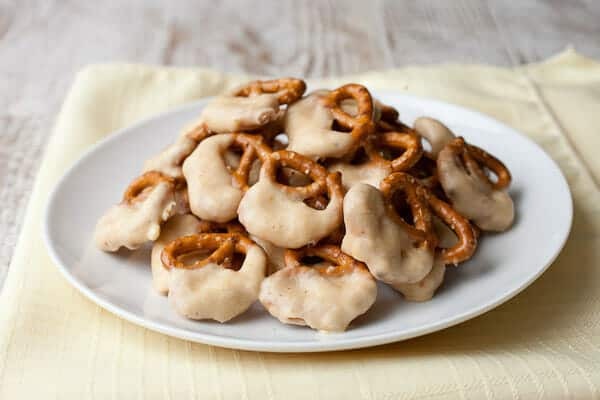 I made a few different versions of these ‘nacks to try to find a good way to get the yogurt mixture to stick to the pretzels. To be honest, nothing really worked like the yogurt dipped pretzels you find in the store. Those have a bunch of other binders and stuff in them. This dip is just four ingredients and you can whip up a batch in a few minutes. 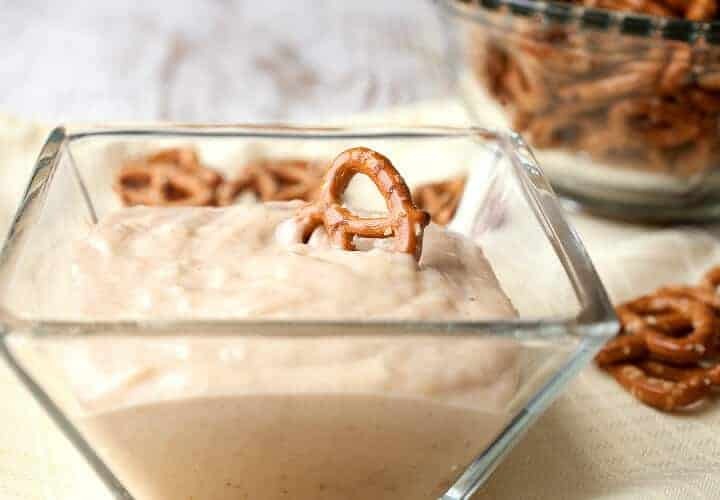 It stores great in the fridge so I’d recommend just dipping the pretzels as you need them! I sort of had this ‘Nack in mind for kids, but to be honest, I also loved the salty and sweet combo! A great 4-ingredient snack for kids that adults will love too thanks to the perfect sweet and salty combo! 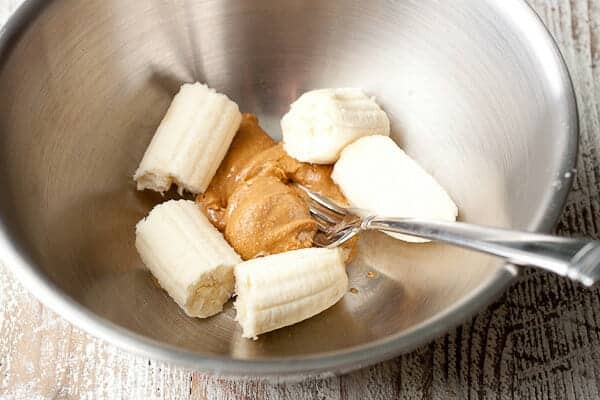 1) In a medium bowl, mash together banana and peanut butter with a fork until mixed. 2) Add in Greek yogurt and use a hand mixer to beat until smooth. Then add in powdered sugar (1 cup for sweeter version) and beat until smooth a second time. 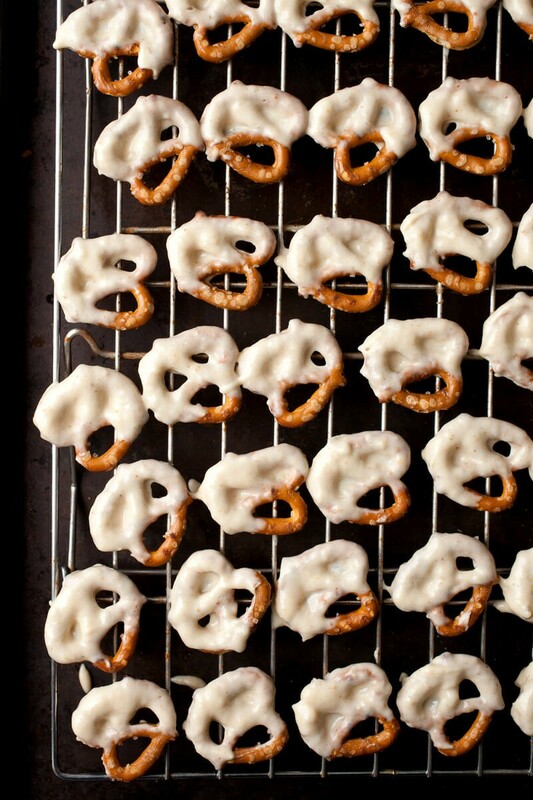 3) Dip pretzels in the dip. You can freeze the dipped pretzels but you have to keep them cold or they will melt. Personally, I just like to serve it as a dip and let people dip their own pretzels! Basically every ingredient in this dip is in the title. Start with a ripe banana and some creamy peanut butter and mash that together with a fork. Then add the yogurt and blend it until smooth with a hand mixer. 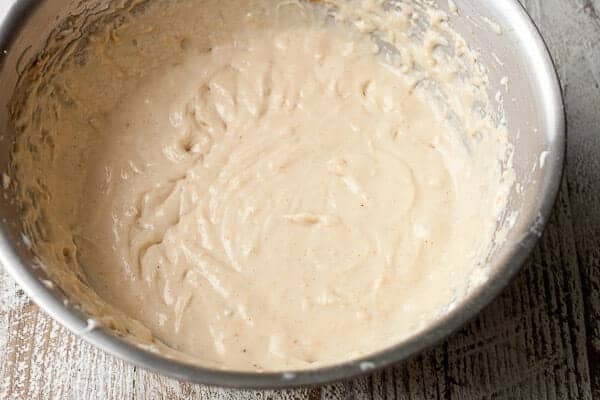 It’ll be a little thick at this point and adding some powdered sugar to the mix helps make it more of a dip and gives it a little sweetness to counter the tangy yogurt. You can use anywhere from 1/2 cup to 1 cup of powdered sugar. More than that and it almost turns into a frosting. Ideally, I wanted this to kind of stick to the pretzels. 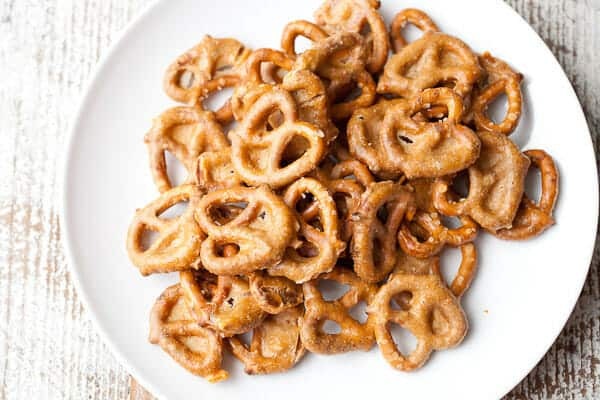 It coats the pretzels really nicely and sticks to them perfectly. My first thought was maybe I could bake the pretzels at a really low temp and dry out the coating. I put them in a low oven for 2 hours and it sort of worked. The pretzels lost the great color and texture contrast and it’s also silly, in my opinion, to turn on the oven for hours to make a snack. Next try was to freeze the pretzels! This totally worked with one caveat. You have to keep them frozen. As soon as you take them out they start to melt and you’ll quickly end up with a mess on your hands. I did really like them cold though, especially on a hot summer day! If you want to freeze them, do so in an even layer on a baking sheet and then you can store them in a bag and pull out just a few at a time to snack on. Ultimately though, I realized the best way to eat this snack is just to use it as a dip! 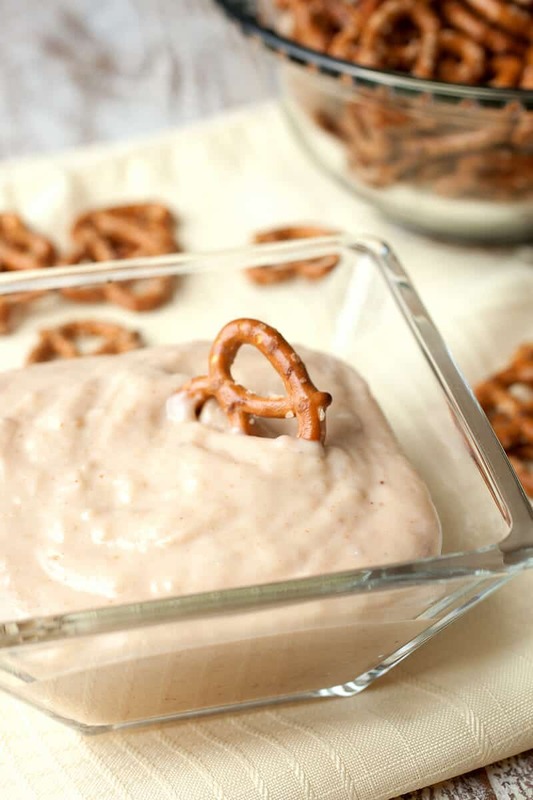 Let people dip their own pretzels or dip a few and put them on a plate for a kiddo. It’s a surprisingly delicious dip and any kid will love it. Once the dip is mixed up, you can keep it in the fridge for a few days without a problem. Eventually, the banana will brown a bit and you might want to mix up a new batch. Exchange the powdered sugar for honey and you’ve got the at-home recipe for Frosty Paws (dog ice-cream bars that you can buy at the grocery store for an egregious fee). My mom told me they sounded good when I made them; I calculated the Weight Watchers points for her. Only 1 for a frozen muffin tin serving! Ha! Nice Mandy. Thanks for the idea!